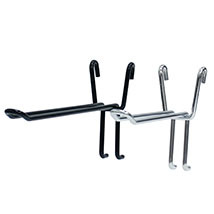 Display your merchandise effectively and safely with safety hooks for grid! These 8 in. grid safety hooks work on 3 inch and 3 1/2 inch grid. Available in black and chrome. The peg hook thickness is .228 in. Add a security lanyard to keep your product safe. Lanyard, item 8368 sold separately. For further offerings, we ask you to take the occasion to look at our comprehensive collection of peg hooks for grid at Specialty Store Services today.